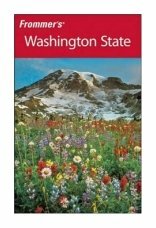 Frommer's Washington State travel guide has almost 400 pages of advice for visitors (and locals) on where to go, where to stay, where to eat and drink, and what to do in the only state in the United States to be named after a President. There's much more to Washington than the Pacific Coast Highway, of course, and this guide covers the whole area, from Spokane to Seattle, and from the highest point at the top of Mt Rainier (14,410ft/4,395m) down to sea level on the shores of the Pacific Ocean. From wine country to whale-watching, from Aberdeen to Zillah, this Frommer's guide covers it all. Author Karl Samson actually lives next door in Oregon, and is the author of Frommer's Oregon guidebook. However, he's also written the Frommer's Seattle guide and is one of our favorite guidebook writers. No, we don't know him at all, even though we're guidebook writers ourselves, but we like his style, and the way his enthusiasm for places shines through in every book he writes. And his Washington State travel guide is no exception. Nor is it an exception to the Frommer's format which involves beginning the book with a few pages on 'What's New', followed by the opening chapter: 'The Best of Washington.' Here the author gets to point readers towards the state's best experiences, including Best Beaches, Best Bed and Breakfast Inns, Best Mountain Lodges and Resorts, Best Waterfront Resorts and Lodges, Best Wineries, Best Off-the-Beaten-Path Restaurants, and the Best Family Attractions and Activities. So the Best Beaches – they're mostly going to be along the Pacific Coast Highway, right? Wrong. As the author points out, some of the best beaches are in places like Orcas Island and Whidbey Island. His own favorites near La Push are actually in the Olympic National Park but not on 101, which has decided to take a short cut inland at this point, heading through Forks and only reaching the coast again at Port Angeles. The Pacific Coast Highway is different in Washington. Very different. It runs around the Olympic Peninsula and even takes you in the 'wrong' direction for a while. That is to say, if you're driving south then you'll find yourself driving north up the eastern side of the Olympic Peninsula, while there are parts where the Pacific Coast is nowhere to be seen. We took this guide with us on our own recent road trip up the Pacific Coast Highway, and it proved to be a reliable travel companion. It had a few quirks, of course. We happened to stay in Ellensburg after finishing our Pacific Coast Highway drive and were heading east to Idaho. The only hotel the Frommer's guide recommends is 40 minutes from Ellensburg – so we used the AAA guide and that took us to the really excellent and cheap Cedars Inn and Suites (now the Econo Lodge), just off I-90 and ten minutes from the town center. We also visited Forks on the Olympic Peninsula, and fell in love with this funky little place. We were surprised the guide makes no mention of the single biggest tourist draw in Forks today – the vampires of the book and movie, Twilight. These are pretty minor things, though, and overall we liked the writing, and especially the detailed hotel and restaurant reviews, which really did give you a strong feel of whether you wanted to stay/eat there or not. You could tell the author had covered the ground, just as we were doing, and we wouldn't hesitate to recommend this Washington State travel guide from Frommer's. A newer edition of this guide has been published since this review was written - see the links below.